Maxima, who worked in the field of investment banking before her marriage, was a part of a panel discussion about economic and entrepreneurial opportunities for women. She often advocates for greater economic empowerment for women as a part of her role as the United Nations Secretary General’s Special Advocate for Inclusive Finance for Development. Maxima chose a bright and cheerful ensemble to participate in the forum, wearing a pair of red beaded hoop earrings. The rest of her jewelry was linked to her family. 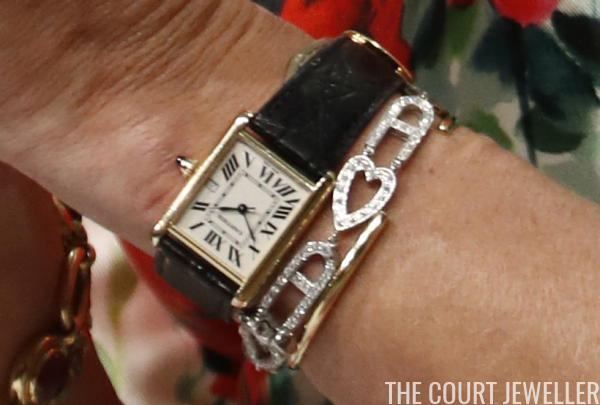 On her left hand, she wore the ruby and diamond ring given to her by King Willem-Alexander after the birth of their first child, Princess Catharina-Amalia (now the Princess of Orange). On her left wrist, she wore a watch and two bracelets: a slim golden bangle and the diamond bracelet set with her family members' initials. 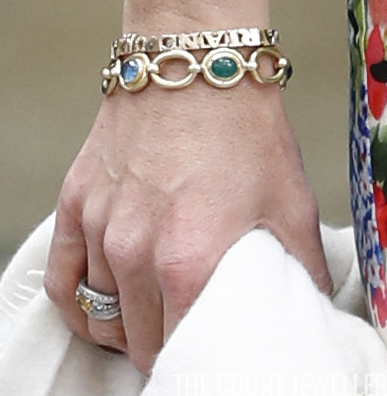 On her right hand, she wore her new gold bracelet with her daughters' names, plus the golden and cabochon gemstone bracelet that is engraved with the names of her family members. She also wore her wedding and engagement rings on her right hand. Here's a look at Maxima's entire outfit for the day, which was expertly coordinated with her flower bouquet.